The time has now come to don your non-stick egg-repulsing helmet and make the biggest omelette you've ever made as you continue your adventure in the second chapter of Chicken Invaders: The Next Wave. * Up to 4-player cooperative play! Cash Invaders is a shooting game. You shoot aliens, get money and buy power-ups. A classic puzzle logic game for Windows. Musical Space Invaders makes you study music easily as if you play game. Chicken Free Screensaver. Photos slideshow. Fight the enemies coming your way and defend the Earth from total destruction. Note teaching software that makes students learn the notes on the musical staff . Qweas is providing links to Chicken Invaders ROTY 3.72 xmas as a courtesy, and makes no representations regarding Chicken Invaders ROTY or any other applications or any information related thereto. Any questions, complaints or claims regarding this application Chicken Invaders ROTY 3.72 xmas must be directed to the appropriate software vendor. 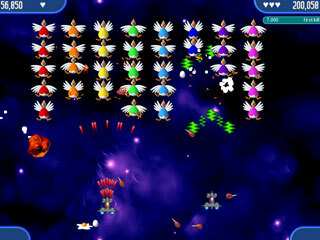 You may click the publisher link of Chicken Invaders ROTY on the top of this page to get more details about the vendor.